← My second quilt and my third and my fourth! I hate have to scroll down forever on recipe sites to get to the recipe, so I’ll keep this brief. Many years ago, before the caramel pumpkin spice mocha-latte craze began, I got an idea in my head to make some scones. But scones have eggs and tons of sugar and nothing about them would work for me. So, I made my own recipe. This recipe has no eggs, very little sugar, and uses one ingredient which can be difficult to find in Alaska. Preheat oven to 400 degrees. Cover a baking sheet with parchment paper (wax paper will not work). Add applesauce, pumpkin puree, pumpkin pie spice, and whole milk. Mix well. Knead three or four times until dough holds together. Turn onto well-floured surface. Divide dough in half. Gently work each half into a round disc about 1 inch thick. Use a knife or dough scraper to divide each disc into 8 sections (like a pizza) for a total of 16 scones. Arrange the scones on the baking sheet and brush with 2 Tbs whole milk to prevent burning. Bake for 15 minutes at 400 degrees until the bottoms of the scones are lightly browned. This recipe yields 16 servings. Each serving has 158 calories, 5g fat, 25g carbs, and 3g protein. 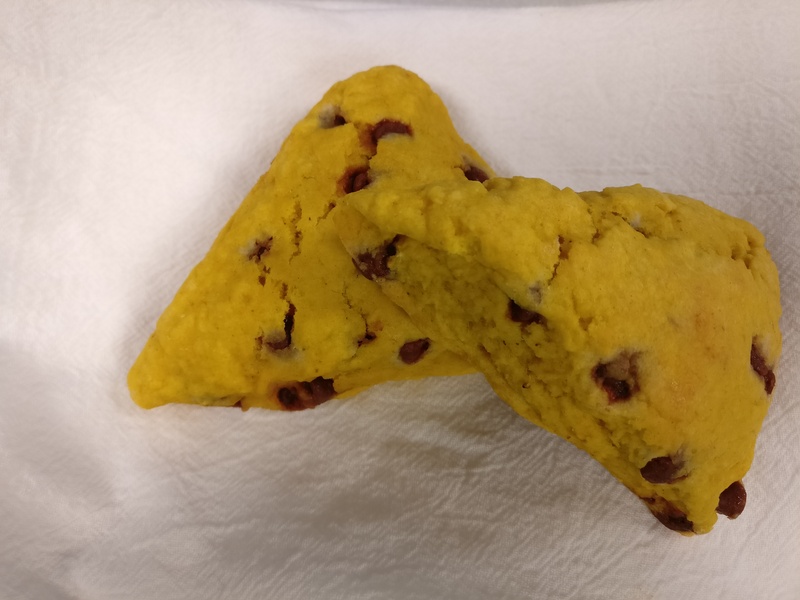 Here’s a PDF of the Pumpkin Scones for printing. If you’re looking to order cinnamon chips, you can buy them on the Hershey’s website. I am in no way affiliated with Hershey. I just like their cinnamon chips in this recipe. I’m sure Amazon has cinnamon baking chips, too. Each 10 oz. bag of cinnamon chips will make about 2 batches of these scones. Here the nutrition info broken out like you’d find on processed foods. This entry was posted in All, Uncategorized and tagged cinnamon chips, pumpkin, pumpkin cinnamon scones, pumpkin pie scones, pumpkin scones, pumpkin spice. Bookmark the permalink.